Two maidens full of secrets submitted for the topic “Secret” at Illustration Friday. The young Tudor maiden on the left might be a lost portrait of a young Anne Boleyn. The one on the right is called “Antonia of Barcelona” and may be the only known portrait of a mysterious young woman who practiced fortune telling for the amusement of Spanish nobility in the mid-eighteenth century. This is my 200th post, holy cow! The first was way back on May 1, 2011! Many thanks and welcome to new visitors and old friends! Slideshow below. 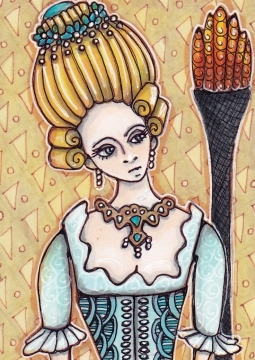 This entry was posted in ATCs and ACEOs, Copic Markers, Elaborate Costume, Progression Photos on November 2, 2013 by The Beast Tender. Happy 200th! You are so super prolific. I love these vintage backgrounds- you are able to take just about any subject and render it in your unique style- i love it! Congrats on hitting your 200th post!! Thats such an accomplishment! I really admire you for all your series. Victorian sounds like such fun……can’t wait to see what comes out of your head! 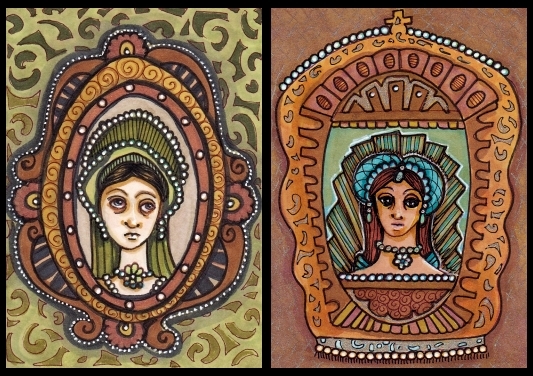 I love the change of style on these 2 ladies……very “baroque”……lovely! Lovely ladies! I do enjoy the patterns you create in each piece-the spirals and triangles all in the same work. Happy 200! I love that Anne Boleyn portrait SO MUCH! You did a brilliant job on the nose and lips, along with the French hood. Love these Cindy. I like these soft subtle colours! Ann Boleyn looks as though she might have a glimmer of foreknowledge of her tragic end … apparently her last words were to apologise to the executioner for stepping on his foot as she mounted the stage. (Why didn’t they teach us THAT sort of thing in history class?!) Just thought I would let you know … the best way to get regular illustrator meetings is to start them yourself!! I did and have been amazed at the different people who lob up randomly and are full of knowledge (like the guy who is animating an octopus and told us they have eight different modes of locomotion). The dresses and hairdoes of these lady’s must be fun for you to work on. You can loose yourself in decorations and mysterious eye expressions! Great new subject, that suits you well! Happy 200th!! That is a lot of artwork published too. I think Lucille is my favorite. I love her hair and jewelry. Congratulations on your 200th post. May there be many, many more. I like this new series. I look forward to more. Your mini-obsessions are always so “COOL”! The lady’s expression, top left, makes me chuckle a bit. because she looks like me in the morning before a cup of coffee. Anne Boleyn had many more reasons to look that way, however, than I ever have. Thank goodness. Your creativity is non-stop, Cindy! There is something dated looking about these..apart from the subject matter. Love the victorian ladies, especially the one with the big hair and turquoise dress. I’ve been having a love affair with turquoise for several years now.